This is the second time I have watched an England football match on TV. The first was about 20 years ago and was a 0-0 draw against Holland. It was boring. This one was excruciating. I am glad I don't have a TV, and I am even more glad I don't follow football. He has to go, Bill. He's very, very bad for a team which is already a bunch of big-heads, on obscene salaries. If they'd given half of what the fans had paid to go and see,then they'd have stayed quiet or even lightly clapped. This thing runs quite deeply across the spectrum of English society, perhaps deeper than Rooney et al understand. Hate to say it - a lot of natural talent, no character. I agree with James Higham. JH: Left comment at your place. I don't really blame Capello. This is basically the same first team that failed to qualify for the Euro 2008. It must be the players, rather than the manager. Mclaren was playing a 4-3-3 that night..
Rooney didn't play against Croatia. Come to think of it he didn't seem to play against Algeria either. Carson, Richards, Campbell, Lescott, Bridge, Wright-Phillips (Beckham 46), Gerrard, Barry (Defoe 46), Lampard, Joe Cole (Bent 80), Crouch. Subs Not Used: James, Ashley Cole, Brown, Hargreaves. It does look as if the team just can't play under pressure. I don't buy this its because Fabio only lets the players have Xbox instead of hookers. Fabio Capello's side once went unbeaten for 58 Serie A matches. That is nearly two seasons unbeaten. Wouldn't matter if it was Mourinho, Hiddink or Ferguson in charge. But Bill, why can't the players just get out there and play with some passion for winning? Surely they want to win, or is the money just too easy these days, and they don't give a toss? It's down to class, or lack of intelligence. All our clever people play rugby. All the chavs play football. C'est ca. By contrast, in Germany everybody plays football, so the smart people can be found in a football team, not just on the rugby pitch. I note that the England rugby team just beat Australia 21-20 in a clever performance where they played to their strengths and steadily strangled their opponents. They also showed some good old fashioned gutsy bloody mindedness. The spoilt bastards of the round ball game appear to lack that facility, and that isn't down to the manager. I am with BQ - they just can't handle the pressure and are not as good as we think they are. The foreigners they play with in the Premier League show them to be world beaters, when they are patently not. It is very frustrating, but I am 34 and the only game England have ever beaten quality oppostion in a knockout tournament is beating Spain in the Euro 96 Quarter finals. Every other time byond the group stage we lose as soon as we play anyone good. Didn't see the game. Didn't need to. The fact is, that whilst "our lads", surround in the Premiership, as they are, by top class acts from all over the world, add that little bit of blood and thunder that complements said top class acts hugely better technical skills. However, take them out of the Prem and put them altogether and you see a clear lack of spark and creativity. How many of our players do clubs abroad buy? Simply, England are not a very good football team. im not sure how anyone can blame capello here. some of the noises coming out of the eng camp are frankly ludicrous. boredom, not enough food(! ), not being able to drink beer etc. as for technique, we see these same players perform absolute miracles for their clubs yet on friday there was zero movement, every other pass went astray and ball control just non existent. to me that smacks of some sort of mental deficiency. 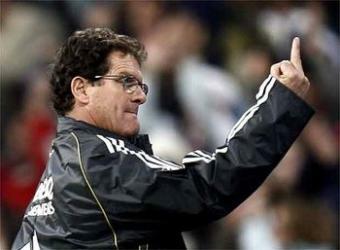 and all this garbage about capello making them over analyse their performances! he should show them the NZ team running themselves into the ground for each other and for the folks back home. no shame in losing/not making it our of the group, but can they say they tried their best at least?